This Bath and Shower Mat really stays in place! Does your shower mat slip and slide around as you are bathing? This self-adhesive Bath & Shower Safety Mat really sticks to the floor of your tub! Unfortunately, some bath mats just don't stay secure enough. Water gets underneath and they 'float' out of place. Instead of suction cups, this non-slip Bath Mat features an adhesive backing to hold it in place. 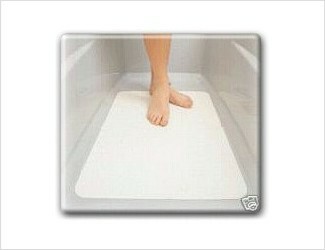 The Bath and Shower Safety Mat is 16" W by 30" L and fits most standard tubs and shower stalls. It can easily be trimmed to the size you need or to accommodate drains. You can even cut out your own custom tread patterns to cover your shower area in a way that is unique to your needs. Mildew resistant and colorfast, the mat can be wiped clean with a mild detergent. A bathmat that slips and slides doesn't provide much protection against falls. A self-adhesive Bath Mat is the ideal solution to increase your safety while bathing! Mats are guaranteed not to peel, wear or discolor for 1 year or we replace the mat free.